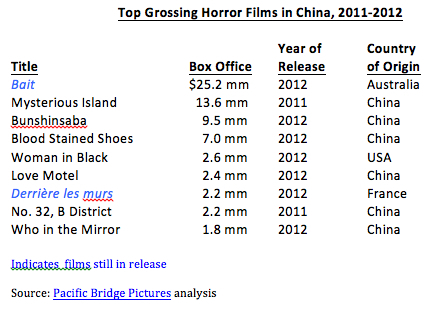 In what is assuredly an all-time first, two horror films ranked among the 5 top grossers at the Chinese box office last week. Although the horror genre has been rather a rarity at PRC multiplexes, due in large part to SARFT censorship strictures, the tide may now be turning for them. Chinese censors have been noticeably friendlier of late to violent and even gory low-budget horror flicks, and audiences have been showing up for them in increasing numbers. Fewer than a dozen horror films have unspooled in Chinese theaters in the past two years, so two such films screening at the same time feels like a veritable gore-fest. 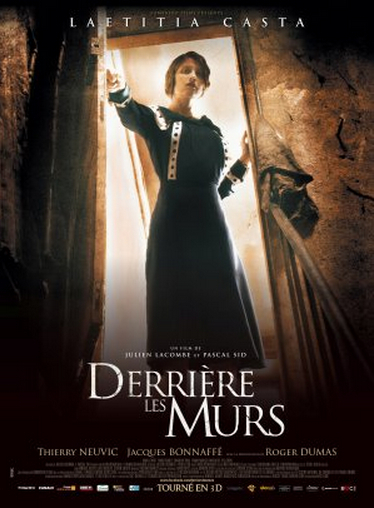 The two pictures are the Australian shark attack thriller Bait 3D, which at a $25 million cume is easily the highest-grossing horror film in China’s history (I’ve made the admittedly subjective judgment call of classifying Prometheus as a sci-fi thriller), and the new French entry Derrière les Murs, a period horror-thriller about a young female novelist who isolates herself in the countryside to write her new book. Before long the writer is haunted by visions and nightmares while the villagers grow worried as several little girls mysteriously disappear. Derrière’s$2.2 million opening weekend tally may not seem like much, but it’s good enough to rank as China’s fifth best horror debut of the year, and among the country’s top ten horror grossers of all time. Given the encouraging signs, now may be a good time for American and other foreign horror-meisters to sharpen up their fangs and take a bite of China’s booming film business. In other multiplex action, The Bourne Legacy held off the Chinese action movie Taichi 2 to retain the number one spot for the second week in a row. Total Recall slipped to third, adding $4.5 million to what is now a nearly $17 million cume. Nationwide admissions totaled 6.4 million, and aggregate box office was $33.6 million, flat compared with the same week last year. New openers this week include the star-heavy Chinese action film Cold War, which opened today, and Disney’s Wreck-It Ralph, which rolls out on Thursday. This entry was posted in Analysis, Box Office Reports and tagged Bait 3D, Bourne Legacy, China box office Derriere les Murs, Cold War, Rob Cain, Robert Cain, SARFT, Taichi 2, Total Recall, Wreck-it Ralph by chinafilmbiz. Bookmark the permalink.